Hey, Ladies! I hope you all had a wonderful week and an even better weekend to come! 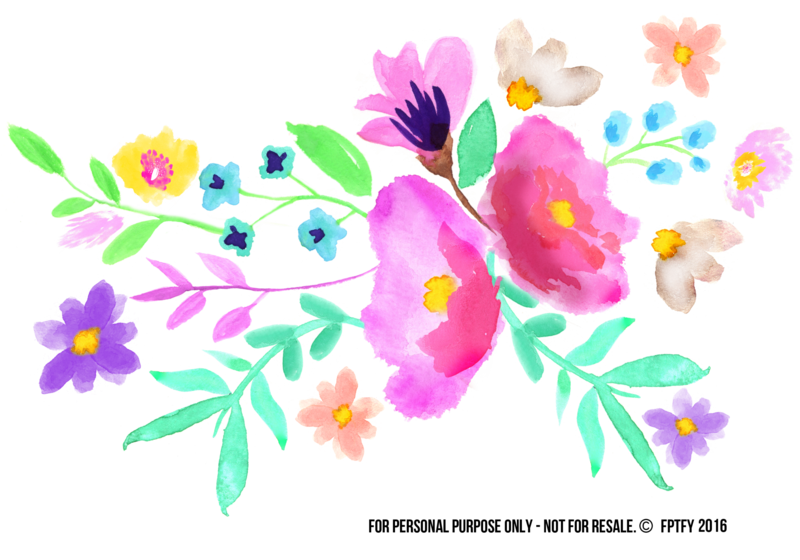 I have some special clip art for you all, that is near and dear to my heart since I created it from start to finish! I’ve mentioned here, that I’ve been working on my watercolor skills and this is the second attempt at it! All credit goes to the good Lord above since I haven never been able to draw a thing growing up .. Therefore, I am so thankful that these turned out the way they did! I just love all the vibrant colors! Perfect to welcome Spring. I’ll be giving away each individual flower element soon, but for now, I’ll leave you with this gorgeous floral spray of spring goodness with you! * This is for personal use only- if you would like to use it for commercial use please email @ [email protected] for details. SO PRETTY! Thank you so much! What a lovely freebie! Very very pretty! thank you so much! This would be so pretty printed out on watercolor paper for a sweet spring card! I’ve downloaded it and will plan to use it for a special someone. I love your freebies! awwww.. well.. i am so glad you finally found me!! ENJOY!! All of your work is so beautiful! Thank you for sharing! Aw, THANK YOU!!!! And you are so welcome!! !